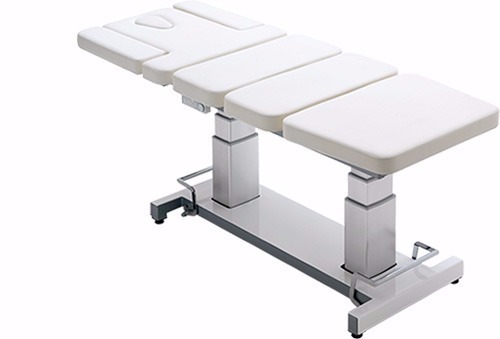 Classic range of examination and treatment tables consisting mainly of two sections, with a 68 cm-long head section that can be used as a backrest. Some models are available with larger wheels for patients' transport. Therapy couches suitable for use in limited spaces due to the absence of lateral movement of the segments when adjusting the height. Professional examination, treatment and manipulation tables. Double motorisation allows therapists to effortlessly place patients in countless myofascial release stretching postures. Large size professional tables. The size and stability characteristics mean they are suitable for neurological treatments. Range of multi-functional tables for examination and for specific treatments, such as podiatry, gynecology, urology and echo doppler investigations. Professional table line dedicated to massage and beauty treatments. Double telescopic columns facilitates the therapy procedures. Wide configuration possibilities for comfort, design and features. 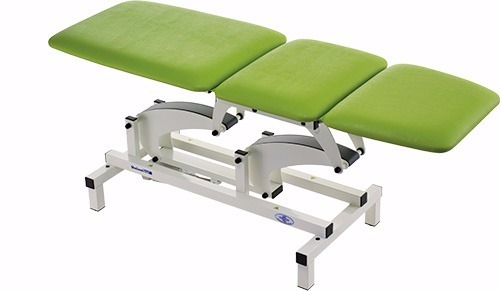 Basic metal tables, for medical examinations and massage treatments. A variety of widths of segments and structure height provide maximum flexibility of choice for specific treatments. Basic wooden tables for examination and visit. Available with fixed or adjustable height, breathing hole and different adjustable sections allowing great flexibility of use. Portable, folding couches and tables for mobile therapy, massage and beauty treatments. These exam tables are lightweight and can be folded and be carried easily. Graded density foam rubber cushions, covered with canvas-reinforced synthetic leather, flame retardant, washable and hihgly durable. A wide range of cushions made from polystyrene micro-size particles, ideal for the postural positioning in the prevention of bedsores. Medical exam stools for medical office and hospital environments. Ergonomic and configurable stools for specific professional needs are available as well as the simple design range stools. Medical office furniture items for medical environments, with a wide range of complements and accessories: stools, chairs, office chairs, service trolleys and foot-steps. 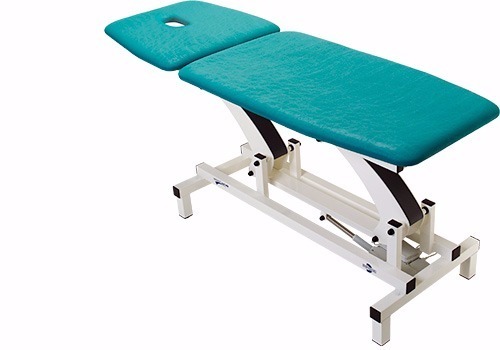 The product code for Chinesport height-adjustable treatment tables is an “open code” that varies depending on the choice of various options available for each model. Each code position has a particular meaning, which corresponds with one or more features of the table. It is also worth remembering that our Research & Development department is continually developing new options and accessories to achieve table configurations that increasingly meet the professionals’ individual requirements. 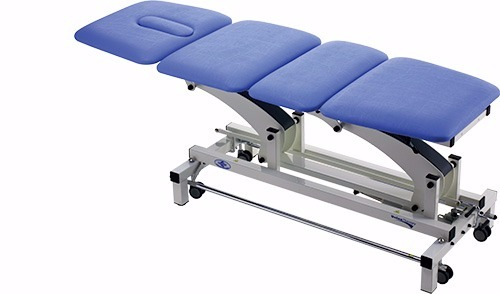 With an experience spanning over several decades, Chinesport offers a range of height-adjustable treatment tables for various uses and with different structural characteristics. Our offering covers various options including tables for examination, transfer, physical therapy, manipulation, specific treatment and massage. The frame is always sturdy, stable, with all rotary joints such as levers and hinges running on self-lubricating bushings to preserve them from wear and stop them creaking during movement. Finally, the base is open at the sides to allow for fitting hoisting equipment or medical equipment trolleys with overall dimensions up to 18 cm. 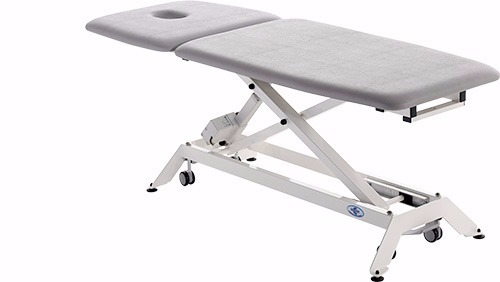 This is the classic range of examination and treatment tables consisting mainly of two sections, with a 68 cm-long head section that can be used as a backrest. The backrest can have positive and negative tilt adjustment: up to +70°/-20°. Height is adjusted via one of the most reliable motors available on the market. A hydraulic version is also available as an alternative. The frame is unique for its simplicity and harmonious design, which is protected by registered Community design. Some of our tables are also available with larger wheels so they can be used to transport patients. This configuration can be completed by fitting a set of safety siderails. A major difference from the VISIT range is given by the head section length which is only 52 cm. For this reason, it cannot be used as a backrest, but it can be fitted with armrests to provide greater comfort for the patient when in prone position. These tables were developed for physiotherapy, osteopathy or for the so-called “Global Postural Re-education” method, and they can be configured with up to six sections to achieve different postural positions for the patient. There is also a model that can be arranged in a seated position for particular use in gynecology. Another difference from the VISIT range is that the head section has a greater tilt adjustment, i.e. positive tilt up to +85° and negative tilt up to -35°, plus the nose/mouth breathing hole is standard. This range is an alternative to the classic ranges called VISIT and THER used for examinations, treatments and physiotherapy. In particular, the distinguishing feature in these tables is that during height adjustment the individual sections remain completely motionless. This makes them particularly suitable for smaller environments or to make the best use of available space, as well as to maintain the position chosen for exercises once the pulley therapy system has been set up. You can opt for a simplified base frame and configure the head section with a backrest that is 68 cm long, instead of a smaller section, 52 cm long, that can come with armrests. The second type of head section can have positive and negative tilt adjustment: up to +85°/ -35°. Our Sinthesi couches allow therapists to effortlessly place patients in countless myofascial stretching postures that can be easily maintained for longer periods of time and without strain. In this relaxed position, various techniques can be applied to facilitate recovery in myofascial elongation, increase joint movement range and achieve an antalgic posture as a relief from acute pain. Also, our Sinthesi tables provide the ideal starting position for exercises that stimulate central activation and for isometric muscular work. Large physical therapy tables that are up to two meters long and have a surface area measuring four square meters. The size and stability characteristics mean they are suitable for neurological treatments, as patients can be guided through a wide range of exercises and sensory experiences, as well as postural adjustments. This range also includes the models used in the unique C.I.R. - Continued Intensive Rehabilitation method. Finally, a special version also allows for use with static supine exercises without having to move a patient to a rehabilitation gym. 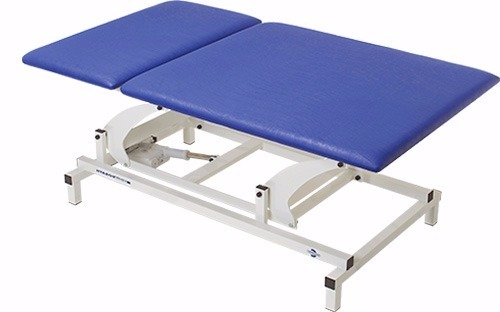 This is a range of multi-functional tables for examination and for specific treatments. In particular, they can be used in podiatry, gynecology, urology, cardiology, geriatrics, beauty, phlebotomy or even to transport patients within care facilities. The table height can be adjusted electrically or via hydraulic piston, while the moving sections are servo-assisted by gas spring. In some versions, the seating section is tilt-adjustable via another motor. As a result, these tables can easily change into a seated, relaxation, Trendelenburg and anti-Trendelenburg position even with the patient lying on the table. Finally, specialized accessories are available to suit individual uses. 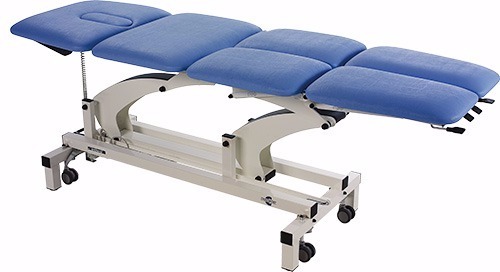 With this range, Chinesport is branching out into beauty, spa and massage tables for the first time, and introduces some additional optional features such as the sections heated at three different temperatures and the synthetic leather upholstery that covers the sides to produce a softer padding effect on the contact surface. Among other noteworthy options, there is a possibility to choose a led lights configuration for combining chromotherapy effects, and even when there is only one option of section width or padding density/thickness clients can request personalized features and options.These tables have two motors, so they can achieve the Trendelenburg and anti-Trendelenburg position via a dual telescopic column system. This part of the code identifies the type of section. The main difference between models has to do with the number of sections and their dimensions, as well as with the posture that patients can put themselves in when using them. Chinesport tables can have an electric or hydraulic height adjustment. The option with electric adjustment also has various drive types, depending on the number of electric actuators. This design choice was made for one of the most reliable electric actuators available on the market. The standard mains supply is 220V 50-60Hz and all drives work with very low safety voltage. Clients can make a specific request for 110V 50-60Hz supply and a non-SCHUKO plug. Some models can be powered by a 24V battery that come with a 110/220V 50-60Hz battery charger. The minimum protection rating for all electric components is IP 54. This type of control can be used to activate the electric height adjustment function. The foot switch is placed on the floor. The connection cable allows for complete freedom of movement. This is an electric height adjustment system that can be reached from anywhere around the table, without having to locate the foot switch. It is activated by simply pressing or lifting the perimeter bar. This hydraulic adjustment is ideal for situations where there is no power supply or when you need to move the table easily. Innovative ergonomic hand control with magnet.Users can attach it wherever they wish on the table frame. It comes with connection cable. The series Unix, Alux and Mini Top have a different hand control. It can be used with models that have two electric actuators, one for table height adjustment and one for the seat or backrest section. This option has an ergonomic hand control with magnet that users can attach wherever they wish on the table frame. This is an alternative to the foot switch control for models that have two electric actuators, one for table height adjustment and one for the seat or backrest section. This is an alternative option for electric height adjustments.The control is securely placed in a special cradle, which can be attached at the base of the structure if so required by the user. The control can also be used as hand control, or attached to the table frame by using the magnet. This option is exclusive to ALUX tables for beauty and massage.It is a dual electric adjustment for height and Trendelenburg / anti-Trendelenburg position. In particular, this configuration features a hand control plus another control panel on the base frame on both long sides. When inserting the product configuration code, please specify if you are interested in any of the options available for position 7 of the code. Swiveling, non-marking wheels with a central braking system activated via a single foot pedal. Moving the table is extremely comfortable and requires no effort. 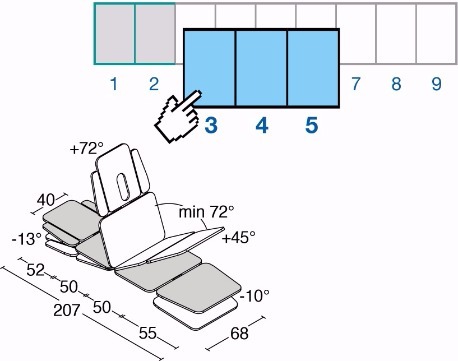 The table cannot be moved when a patient is lying on the table. Siderails offer greater safety to patients while they are lying on the table, or when the professional needs to step away temporarily. They can be fitted as and when needed thanks to an easy manual mechanism. Please indicate if you would like the table to be fitted with wheels and safety siderails, for greater patient safety. The wheels braking system is controlled by a single foot pedal. Padded supports are available in the same color as the upholstery of the chosen model. They can be rotated by 180° and moved by 12 cm. They are designed to achieve the patient postures also specified under the Global Postural Re-education method. Here you can select to add wheels to the table configuration, in addition to the armrests that can rotate by 180°. These are alternative safety siderails that can be attached exclusively to the VISIT TRANSFER table. A characteristic of these siderails is that they can be attached or removed without adding any bulk at the sides. The available options are 2: with seamless rounded edges or squared edges. Giotto is a coated fire-resistant fabric. It is sturdy and easy to care, making it particularly suitable for use in hospitals, care homes, spas, rehabilitation centers and gyms. Giotto has a leather effect surface and shiny finish, and comes in a wide array of colors. Giotto contains Vinyzene, an anti-microbial that is added during the processing stages to create a protective barrier against dust mites, bacteria and fungi, preventing any bad odors and allergies. Upon placing an order, please remember to specify the upholstery color code. Choose among a standard range of 24 colors. Update, printed in October 2017; 32 pages; English. International Edition, printed in October 2016; Pages 01 - 84; English.